Under the Oslo Accords, the Palestinian Authority (PA) was created to exercise partial control over the occupied Palestinian territories of the West Bank and Gaza Strip. Key issues such as the status of Jerusalem and Israeli settlements, the right of return for Palestinian refugees displaced by Zionist militias when Israel was created and the borders of a future Palestinian state were left unresolved. Today, an emboldened state of Israel, backed by the Trump administration’s recognition of Jerusalem as its capital, is determined to impose its own one-state solution on Palestinians: one that denies Palestinians a state of their own. Claiming it has no “partner for peace”, the Netanyahu government is realising Zionist ambitions to control all of historic Palestine and purge the territory of its indigenous inhabitants. East Jerusalem, illegally occupied in 1967, is today home to more than 350,000 Israeli settlers, who outnumber the city’s historic Palestinian custodians; another 400,000 settlers defended by army convoys occupy large swathes of West Bank land. A network of checkpoints, walls and Israeli roads strangles the life out of Palestinian villages. Thousands of Palestinians who have defied the occupation are incarcerated in Israeli prisons under martial law. Yet Palestinians continue to resist. Palestinian youth activist Ahed Tamimi’s slap of an Israeli soldier invading her home on 14 December was a powerful rebuke to one of the world’s most powerful armies, creating outrage in Israel and stoking pride among Palestinians who refuse to bow to the occupation. Ahed Tamimi will face an Israeli military court alongside her mother Nariman and cousin Mohammed. Their fate is already determined: 99 percent of Palestinian prisoners are found guilty. Facing charges including aggravated assault against a soldier, obstruction and throwing stones, Ahed could spend a decade in jail. On both sides of the green line that separates Israel, founded upon the dispossession of Palestinians in 1948, from the territories of the West Bank and Gaza, captured in 1967, support for a “two state solution” is fast eroding. Today such a “solution” has the support of only a minority of Israeli Jews and West Bank Palestinians. In Israel, successive prime ministers have mouthed rhetorical support for such a solution, while creating “facts on the ground” to preclude a viable independent Palestine. Since the signing of the Oslo Accords, the number of Israeli settlers in East Jerusalem and the West Bank has tripled. When Israel annexed East Jerusalem after its 1967 military occupation, 20 Palestinian villages never part of the city were also annexed. The new Israeli municipality of East Jerusalem was 10 times larger than it had been under the previous Jordanian administration. Palestinian inhabitants were denied Israeli citizenship and all the rights that accompany such a status, including the right to buy land and participate in national elections. What has followed is a policy of Judaisation, which, according to Israeli Committee Against Homes Demolitions director Jeff Halper, aims to “eliminate the idea that there is an East Jerusalem [and] to create one unified, Jewish Jerusalem”, through settlement construction and the demolition of Palestinian homes. US government support for a two-state solution has similarly been hollow rhetoric. The infrastructure of Israeli occupation – the settlements, the apartheid wall, roads on which only Israelis can travel and checkpoints that deny Palestinian freedom of movement – would not be possible without U.S. aid to the Israeli Defence Force, which boasts a standing army of 176,500 troops and nearly half a million reservists. Under a memorandum signed by the previous Obama administration, the IDF receives US$4 billion of U.S. aid annually. While claiming the status of peace broker, successive U.S. administrations have offered Israel a blank cheque, supporting its 1982 and 2005 invasions of Lebanon and three bloody assaults on the Gaza Strip over the last decade, inflicting thousands of deaths and untold destruction on the 2 million-strong, defenceless and besieged Palestinian population. The U.S. ensures Israel can act with impunity and its war crimes go unpunished. This impunity reflects the vital strategic importance of Israel to U.S. interests in the Middle East. While the U.S. has been Israel’s principal backer since 1967, the destabilisation of the Middle East that followed the U.S. invasion of Iraq, the short-lived Arab Spring and the increasingly assertive power blocs led by Iran, Saudi Arabia and Turkey have made Israel more important to the U.S. as Trump seeks to address the relative decline in U.S. power. A vital component of the Oslo illusion has been the Ramallah-based PA, which, under the leadership of Mahmoud Abbas, has pursued a strategy of seeking diplomatic recognition of a Palestinian state. Yet the PA has no more powers than your average town council. Under the Oslo Accords, the PA exercises direct control over only 18 percent of the West Bank and has joint authority, with Israel, over a further 22 percent. The PA is in almost every respect an appendage to the Israeli state, beholden to Israel’s key allies, which finance it. 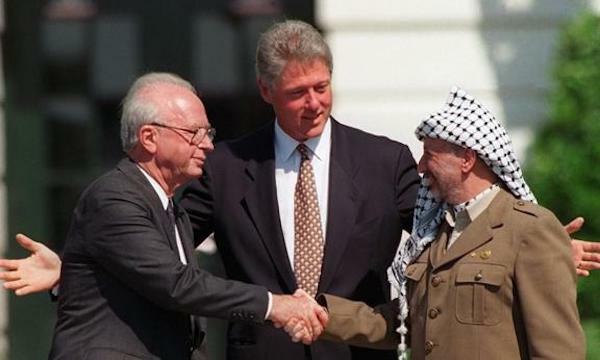 The Oslo Accords obliged the PA to share information with Israel about armed resistance to the occupation. The PA spends US$1 billion annually on security, accounting for half of its civil service. The consequence of collusion with the Israeli security apparatus has been deadly for Palestinians living under occupation. Palestinian activists and journalists who criticise the PA are subject to harassment, detention and even execution by joint operations of PA and Israeli security forces. Palestinian politicians Abbas and Erekat are caught in a bind. After being tossed aside by Trump, having outlived their usefulness to Washington, they remain dependent on financing from the Gulf States and the European Union to keep the PA alive. However, these states will follow Trump in cutting off funding for the PA if the PLO recants its recognition of and security coordination with the apartheid state. In the besieged Gaza Strip, the governing Hamas faction faces a similar dilemma. Last year, it softened its stance on refusing to recognise Israel, throwing its support behind a “two state solution” based on a Palestinian state within the territories occupied in 1967 (just 22 percent of historic Palestine). Yet its close relations with Hezbollah and Iran pose a direct challenge to mending relations with Fatah, which exercises control over the Ramallah-based PA.
Trump’s Jerusalem move follows an ill-fated mission by Saudi crown prince Mohammed bin Salman to secure a virtual surrender by the PLO. According to the New York Times, this deal would have given Palestinians a state in a “non-contiguous part of the West Bank”. Israeli settlements would remain and East Jerusalem would stay under Israeli control. Palestinian refugees’ right of return would be denied. Nothing has been as harmful to the Palestinian struggle to end Israel’s occupation and unrelenting theft of territory intended for its state as Abbas’ insistence on the preservation of the PA and the myth that it serves as ‘a state in formation,’ when it so clearly allowed Israel to solidify its occupation. Trump’s move on Jerusalem achieved what years of Israel’s settlements failed to do—shatter the illusion of a two-state outcome, and allow the Palestinian national movement to turn into a struggle for rights, which is to say a struggle to end Israel’s de facto apartheid regime. Over the past decade, the boycott, divestment and sanctions campaign has achieved what numerous rounds of “peace negotiations” and lobbying for Palestinian statehood have not. World opinion increasingly views Israel as an apartheid colonial state. While Israel continues to enjoy the backing of the US, the European Union and the Gulf States, its credibility is being undermined. The international campaign to isolate apartheid Israel, free the Palestinian political prisoners and support the struggle for Palestinian liberation has an important part to play in making that history.